No matter what stage you are in with your business, having a clear and concise explanation of what your business does is critical. Taking the time and focus to write an Elevator Pitch for your business will pay off, both online and in daily conversation. Think about it, how often does someone ask what you do, or what your business does, and you stammer through either a quippy little sentence, or else you give a long rambling explanation that doesn’t really benefit the hearer. What if, instead, you could tell them in a few sentences exactly what your company does, who it benefits, and even how people can do business with your company. Let’s walk through the process of preparing that Elevator Pitch. Hopefully you have narrowed down your business to one main focus. If your business is relatively new, you will want to head over here and make sure you are getting off on the right foot. Once you clearly know what it is that you do, and what you have to offer, you are prepared to communicate it clearly. What is the one thing that your business offers? What problem does your business solve for your customers? What do your customers gain by doing business with you? Once you have written out answers to each of these questions, it’s time to put it all together. Take your answers to these questions and combine them into a paragraph. Take some time and tweak it. What words could you remove? How could you say that sentence more clearly? Edit it down to one concise paragraph. This paragraph will be your business’s Elevator Pitch. Most small business owners are experts at their product, but many could use help getting their business set up and effective on social media. 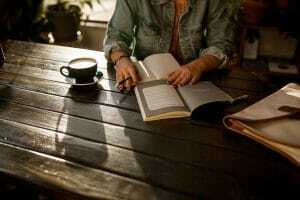 My blog, Social Media and Coffee takes the overwhelm out of social media marketing for small businesses. Much of what’s out there on social media training is so technical and deep that it’s easy to glaze over reading it! Being a complete “regular” myself, I give practical step-by-step instructions and tactics, as well as some real-life advice to managing it all. So check out my blog and feel free to recommend it to anyone starting their business on social media. Take your own paragraph and practice it. Speak it out loud and memorize it. Know the general flow of your Elevator Pitch so that you can conversationally speak it in any setting. Review your elevator pitch weekly at first, so that you have it on the tip of your mind. No more stammering through an answer to what it is that you do! Word of mouth is important! This Elevator Pitch will be your go-to answer when anyone asks you what your business is about. Also, now that you have a prepared Elevator Pitch, you can use it in various places online. This paragraph is where you will get the information for every tagline, bio and “about” page on your website and on social media. You have a paragraph version of your elevator pitch, it’s time to also make a version that is a simple sentence. I take the overwhelm out of Social Media Marketing for small businesses. Go through all of your social media accounts and put whichever version of your Elevator Pitch is appropriate. For platforms like Facebook, the paragraph version of your pitch works nicely in the “About” section. For platforms that have a more concise bio section, such as Instagram, use the sentence version of your Elevator Pitch. At this point, you have continuity across all of your accounts and the message of what you offer is clear. Also, you are prepared to communicate clearly about your business at a moment’s notice! 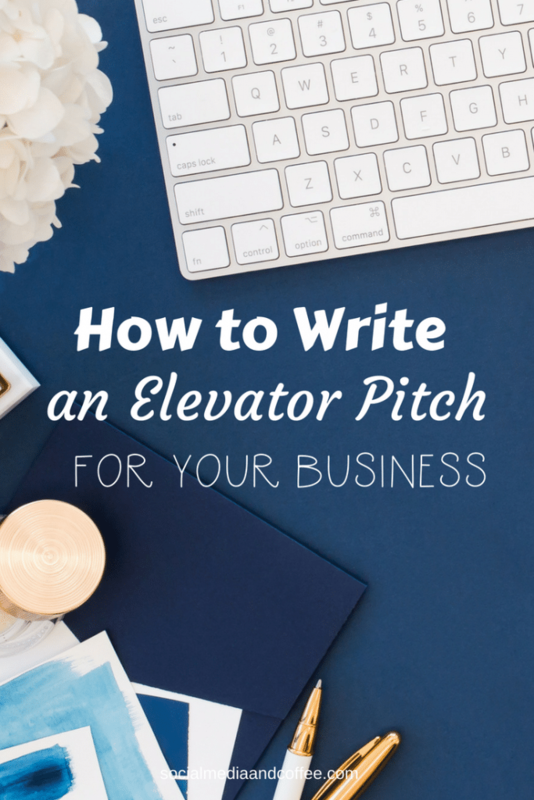 Want to remember this How to Write an Elevator Pitch for Your Business article? Save it to your favorite Pinterest board!